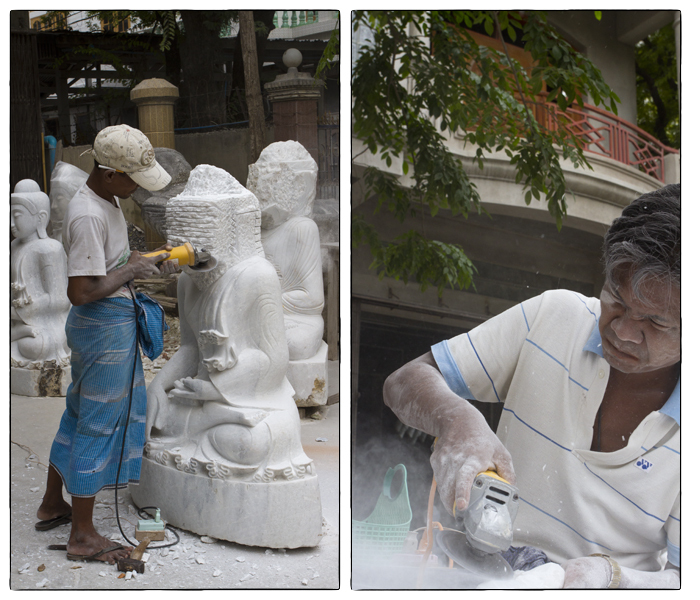 Workers rough out Buddha images by hand on Marble Street in Mandalay. Photos by David Lansing. Still looking for my personal Buddha, the Thoughtful Buddha known as Pang Rumpueng, I asked Sai if there was a market in Mandalay that specialized in Buddha images. Well this sounded promising. So we got a taxi and went to Marble Street. And let me just say that once you’re there, you’ll know exactly why they call it Marble Street. Down a long dirt road covered in fine white dust were literally dozens of workshops where laborers roughed out, chiseled, refined, polished, and washed Buddhas out of marble—Reclinging Buddhas and Enlightened Buddhas and Calling the Earth Buddhas. Some were no more than an inch or two tall; some were larger than life. It looked like a nasty job. Marble dust was as thick as London fog everywhere and very few of the workers I saw wore masks. The white powder coated their hair, their face, their arms—everywhere. I can’t imagine this is good for you. We popped in to one shop after another asking if they had a Thoughtful Buddha image. Everyone shook their head no. Imagine, a whole street filled with Buddhas and not a single Thoughtful Buddha to be found. Very disappointing. 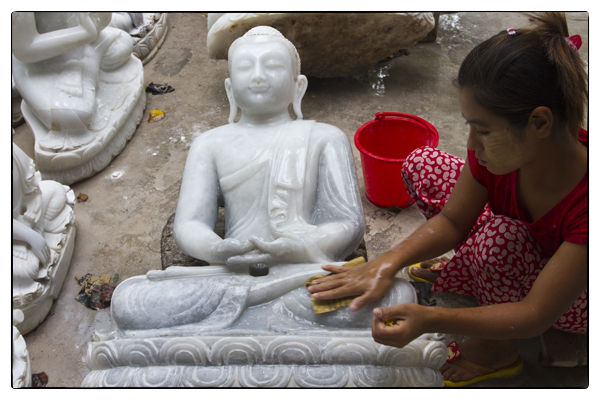 A young woman cleans a marble Buddha on Marble Street in Mandalay. Photo by David Lansing. 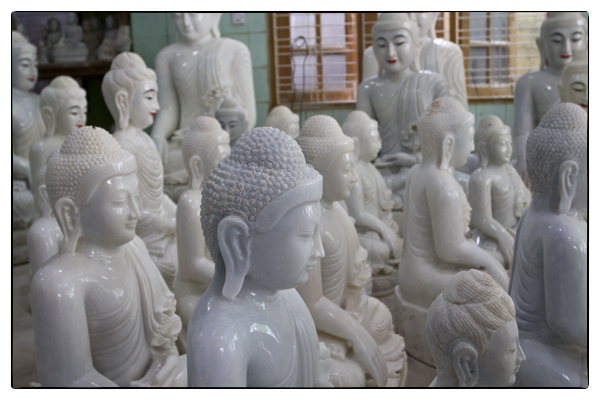 On Marble Street you can get just about any type of Buddha you want–except for the Thoughtful Buddha. Photo by David Lansing. For an hour or so I wandered around Amarapura. Such a mixture of sights and smells–the pungent aroma of frying fish and crabs, the cacophony of mostly-women’s voices enticing customers to the roadside cafes, the children laughing and running around the market, and hundreds and hundreds of monks in blood-red robes everywhere. 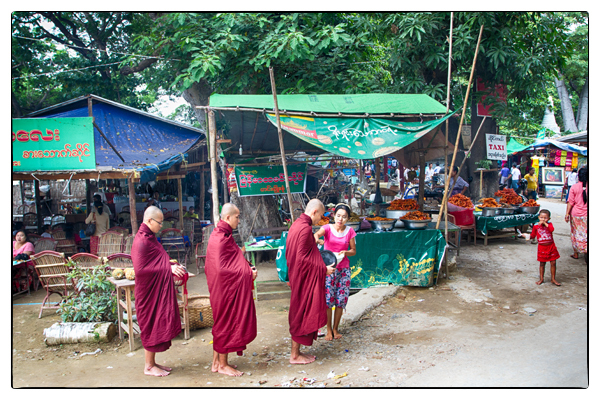 Monks begging for their daily meal outside the market near the U Bein’s Bridge. Photo by David Lansing. 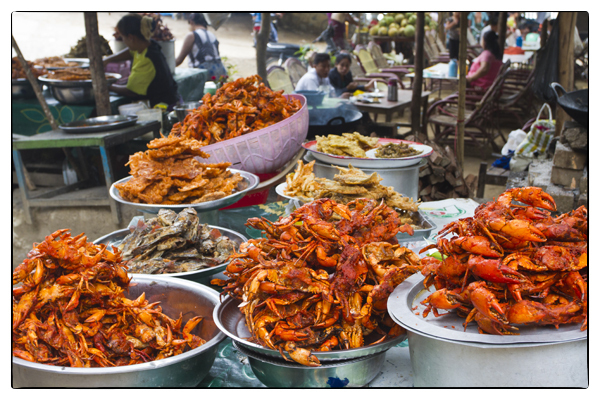 Street food included fried crabs from Lake Taungthaman. Photo by David Lansing. A young child with thanaka on his face walks around the market with his mother. Photo by David Lansing. Little girls wait for their mother as she shops the market. Photo by David Lansing. 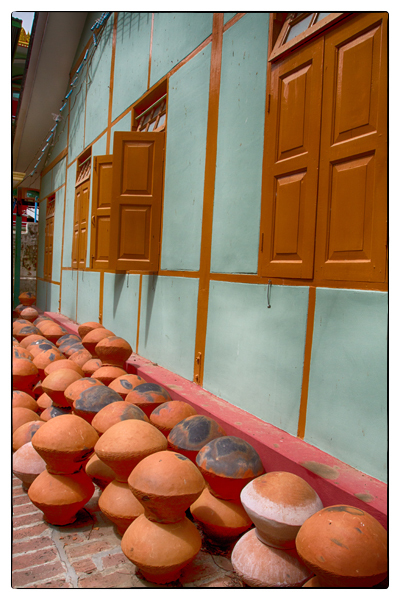 Clay pots outside the Mahagandhayon Monastery. Photo by David Lansing. A fruit vendor at the market. Photo by David Lansing. 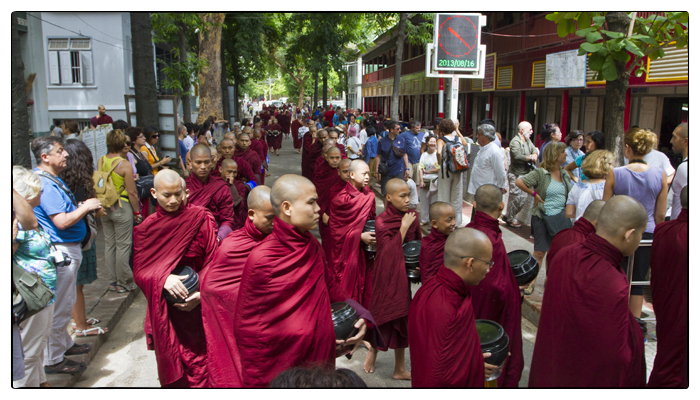 A line of monks for as far as the eye can see wait for their daily meal at the Mahagandhayon Monastery in Amarapura observed by almost as many tourists. Photo by David Lansing. Just a few minutes walk from U Bein’s Bridge, the longest teak bridge in the world, is another remarkable site, Mahagandhayon, one of the largest Buddhist monasteries in Myanmar. 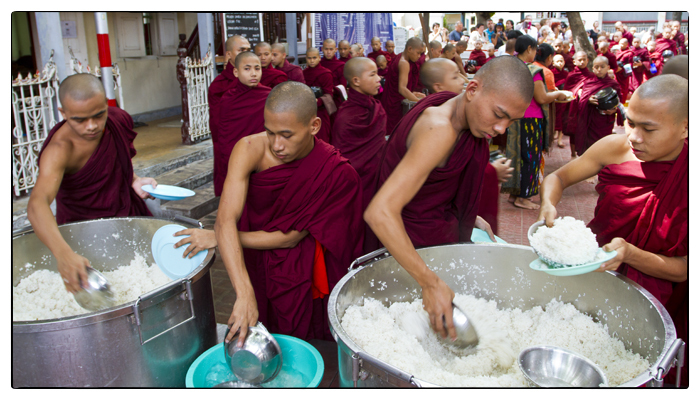 Over a thousand monks live in the monastery so you see them everywhere in Amarapura but the big thing to do is to go to the monastery around 11am when hundreds of monks line up to receive their one daily meal. It’s quite a sight. As is watching the almost equal number of tourists jostling each other to take photographs of the monks. Monks cross over U Bein’s Bridge, the longest teak bridge in the world. 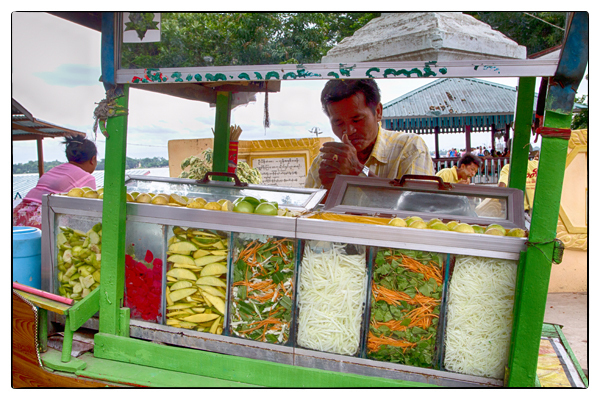 Right, a vendor fries up shrimp cakes next to the bridge. Photos by David Lansing. It seemed odd, but the first thing my guide, Sai, wanted to do in Mandalay was show me a bridge. “U Bein’s Bridge. Most famous bridge in the world,” said Sai. Really? I’d never heard of it. “What makes it famous?” I asked him. Anyway, the bridge was built around 1850 when the capital moved from Ava (an hour’s walk southwest) to Amarapura. The mayor of Amarapura, U Bein, salvaged the teak planks from the old palace building to construct the 1.2km bridge over Taungthaman Lake. So if you’re at all like me and are told that the most famous bridge in the world—which you have never heard of—is a half-mile long teak bridge made from two-hundred year-old planks taken from a royal palace, you imagine that what you’re going to see is something very grand. But that’s not what U Bein’s Bridge is at all. It’s very simple. And low to the water. And rather rickety (many of the pillars look dangerously decayed and some of the planks were cracked or broken so you had to be very careful where you stepped). Basically it’s a very pedestrian bridge with no architectural flourishes that serves the thousands of locals—farmers, shoppers, monks—wanting to get from one side of the lake to the other. I noticed that there were a number of police on the bridge and asked Sai if that was to prevent acts of vandalism. He said no, it was to prevent local youths from harassing tourists. “Some locals tired of so many tourists walking on bridge,” he said. If we were a shrimp fisherman trying to get from one side of the lake to the other, all the camera-toting tourists would bother us too. 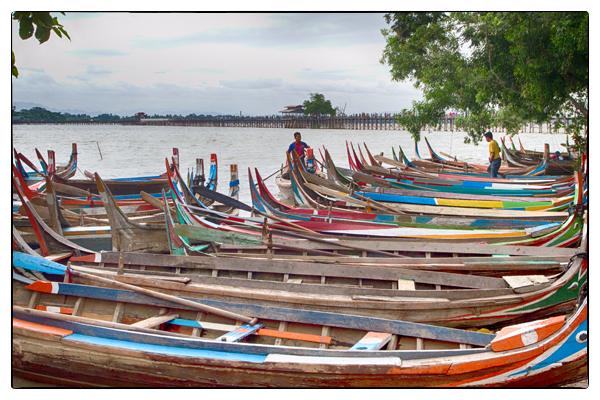 The best way to see Lake Taungthaman and U Bein’s Bridge, in the background, is to rent a gondola. Photo by David Lansing. Tourists off to see the temples in Bagan by horse and buggy. Photo by David Lansing. We leave very early tomorrow for Mandalay. Which makes me a little bit sad. 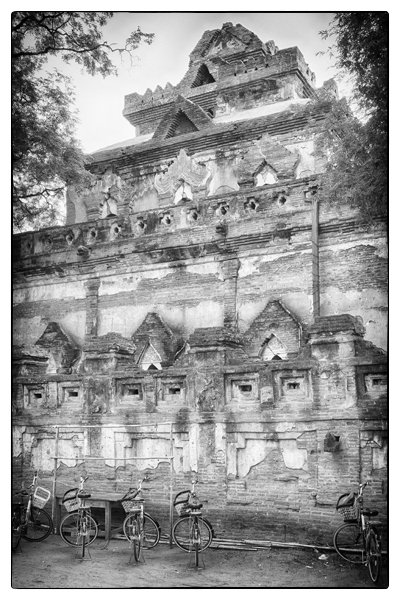 I feel like there is still so much I want to see and do in Bagan. During our stay we’ve been bused around on a very comfortable little air-conditioned coach but I think when I come back—and I will come back—I’d like to see Bagan by bicycle or horse-drawn cart. And of course, I want to see the temples from a hot-air-balloon. I’ve noticed that at our hotel there are dozens of blue Chinese-made bikes available for guests to use. That seems pretty common. All along the roads you see couples—some young, some not-so-young—wobbling down the road on their way to visit a temple or two. I asked one middle-aged British couple at our hotel if they weren’t afraid of getting lost. “Absolutely!” thundered the sunburnt husband. “That’s why we hired a guide.” The guide meets them at the hotel and leads them by bike to whatever temple they’d like to visit. It seems most of these guide (whose rates are very reasonable) also know where to find the key-holders to get in to the locked temples. 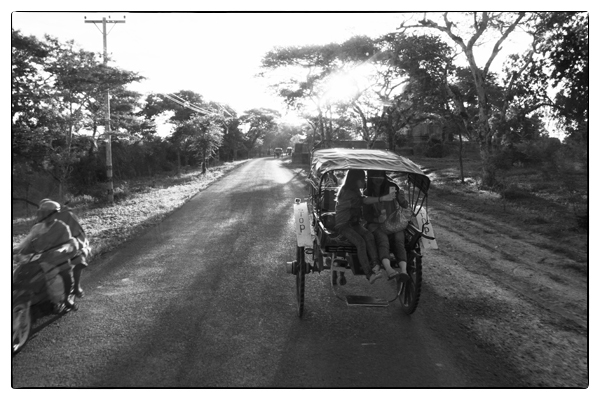 Even more romantic, I think, would be to explore Bagan from one of the more than 250-odd horse carts that you see everywhere. Most drivers, from what I’ve been told, speak at least a little English and, again, can act as guides to less-visited temples. Usually your hotel can fix the price and duration of the trip for you and make any other arrangements (such as stops for lunch or dinner). It shouldn’t cost more than $15 or $20 a day for two people. Or, if you feel like splurging, you can rent a Victorian horse and cart that seats four in real seats (much more comfortable) for about $35/half day. Tourist bikes parked outside the Ananda Temple in Bagan. Photo by David Lansing.